As global enterprises expand their ecosystem of B2B partnerships, there is a compelling need to integrate the disparate systems of software, hardware and data for effortless engagement. As a business, we understand the complexities of diverse business environments that no two businesses are alike. 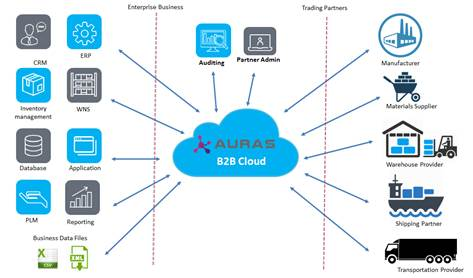 AURAS-B2B is the comprehensive integration services built to simplify the business and business integration using advanced iPaaS (Integration Platform as a Service). AURAS-B2B designed to integrate Business to Business related data, process and services using industry standards such as EDI, EDIFACT, HIPAA/HL7, ACORD AL3/XML, and APIs. AURAS-B2B solution built based on the combination of Service Oriented Architecture and Messaging Standards to exchange standards of data across enterprises. Ensures a seamless data integration between enterprise and partners for an evolved business realization. Centralized data system to configure all partner integrations and interactions across time zones. Enjoy improved productivity, shorter document cycles, and compliance with the latest protocols and standards.